Francena McCorory was born October 20, 1988 and is an American track and field athlete, known primarily for running the 400 metres. She is the NCAA and American indoor record holder in that event and is a United States representative to the 2011 World Championships in Athletics. 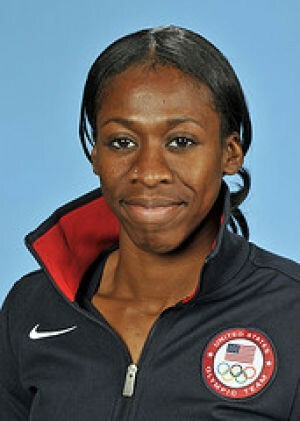 McCorory attended Bethel High School in her hometown of Hampton, Virginia where she displayed her talent for the 400 metres. A notable performance was at the 2005 Virginia Group AAA Eastern Region meet, where McCorory took her team's baton as much as 80 metres behind the leaders of the race, but cruised to victory past six other teams. Later, she set the National High School Indoor record at 51.93, a record previously held by future champion World Champion Sanya Richards, in her only attempt at the distance. Despite being recruited by larger universities, McCorory continued to Hampton University. She won the 2009 NCAA Women's Indoor Track and Field Championships and later in the year finished third in the NCAA Women's Outdoor Track and Field Championships. In 2010, she went to Fayetteville, Arkansas to defend her championship. Instead of merely repeating as champion, she won the race by over a second, setting the NCAA record and beating Diane Dixon's 19 year old American record in the event, running 50.54. Later that year she won the NCAA Outdoor championship, in 50.69, actually slower than her Indoor record. A few weeks later, she improved her personal best to 50.52 while finishing second at the USA Outdoor Track and Field Championships. After graduating Hampton, she improved her best to 50.49 again in second at the USA Outdoor Track and Field Championships, which qualified her for the 2011 World Championships in Athletics. A month after that, she took her best down to 50.29 at the Herculis meet in Monaco. She took it down one more time to 50.24 in the semi-finals of the 2011 World Championships in Athletics. In the finals, she wasn't quite as fast, finishing in fourth place in her first experience on the world stage. A few days later she anchored the United States team to a gold medal in the 4400 m relay. Leading into the Olympic Trials, she improved her personal best to 50.06 at the Adidas Grand Prix. At the Olympic Trials, she qualified for the final and was assigned lane 7, just outside of Sanya Richards-Ross in lane 6. Richards-Ross ran hard from the start closing down the stagger on McCorory. Sensing the challenge, McCorory exploded down the backstretch, leading around the turn to the head of the home stretch, but she paid the price for the early effort and struggled to the finish. Richards-Ross charged past her, in the process setting the best time of the year, followed by Dee Dee Trotter, who made her third straight Olympic team. McCorory managed to hold off Debbie Dunn to claim third place and a trip to the Olympics. Olympians are the best at what they do. Dedication, training as well as going above and beyond to represent their respective countries. The booking agents at AthletePromotions can easily assist with booking Francena McCorory speaking engagements or appearances from some of the top Olympic gold medalists. We have years of experience in booking Olympic athletes for VIP Meet & Greets, keynote speeches and autograph signings. Hiring a Olympian like Francena McCorory is a very easy process. Our team can provide fees, availability and all costs associated in bringing out an Olympian to your next big corporate event. We can easily find Francena McCororys agent to make your next event the best it can be.A Francena McCorory appearance will be sure to reward your companys employees, customers and clients. Most likely, Olympic fans and corporations can find Francena McCorory's official website, charity involvement, Twitter account, representation, publicist and management info at www.Francena McCorory.com.